Volvo 122, Volvo 142, Volvo 144, Volvo 145, Volvo 1800, Volvo 444, Volvo 544, Volvo 240, Volvo 242, Volvo 244, Volvo 245, Volvo 262, Volvo 264, Volvo 265, Volvo 740, Volvo 760, Volvo 780, VOlvo 940, Volvo 960, Volvo S90. Volvos manufactured between 1957 and 1998 are considered to be Volvo Classics. Some prefer the term “vintage” Volvos. These cars are simple to drive, and simple to fix - if you know what you're doing. 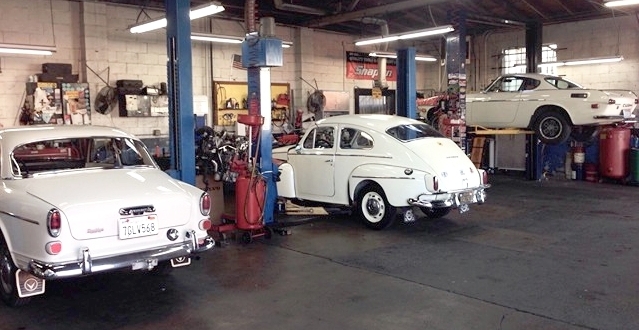 SVS has two full-time experts in the repair and maintenance of classic vintage Volvos, something you won’t find at Sacramento Volvo dealerships. For nearly 40 years Founder Robert Marcello and Technician Ron Flynn have been servicing these Volvo lines: 122, 142, 144, 145, 1800, 444, 544, 240, 242, 244, 245, 262, 264, 265, 740, 760, 780, 940, 960, S90. You invested in your Volvo. We're investing in its future. Like your Volvo, we're here for the long term. Whether you have a brand new Volvo, fresh out of a Sacramento Volvo dealership, or that trusted, reliable Classic Volvo you've had for years, SVS is dedicated to investing in technology, the latest equipment and techniques. Volvo is Latin for "I roll"
We'll do everything we can to keep you rolling easy. When you own a Volvo, you're in for the ride of your life. When you bring it to SVS, we're in it for the life of your ride!